The lack of a critical reading of Shivaji has plagued the Indian scene since for centuries. Right from Aurangzeb's court historians, to the British, then the nationalist, dalit and recently subaltern and Marxist have painted Shivaji in contrasting colors. At their hands he has easily been molded into beliefs; he never stood for; ideals, which he never represented; clothed of such character that he never possessed. The result is a too obvious uneasy equivocal figure for any unbiased reader of Indian History. The attempt of this short essay is to set to rest some of these glaring contradictions in Shivaji's assessment by ideologically differing historians. Shivaji, is described by his contemporaries to be physically to be non-conspicuous except his quick and piercing eyes, overflowing with the gift of reading the characteristics of both his friends and foes. Cosmo Da Guarda noted him to be not only quick in action but lively in carriage also, for with a clear and fair face, nature had given him the greatest perfections, specially the dark big eyes were so lively that they seemed to dart rays of fire. To these was added a quick, clear and acute intelligence. Shivaji in contrast adopted a severely Spartan lifestyle, which has often been touted as being one of his several humane assets by his hagiographic historians. Shivaji in the same vein had a natural aversion for alcohol. [which could be put down to his leanings towards the Hindu orthodox religious traditions where alcoholism was considered one of the five deadly sins] While he himself maintained no harems; he did nothing spectacular to improve the lot of women of his land. Despite this, he reserved the greatest respect for his mother. More importantly, he set a new example in the medieval age by respecting the modesty of captured women and refusing to treat them as spoils of war. One popular example would be the exceedingly beautiful daughter in law of the House of Kalyan instead of being reduced to the status of a concubine was restored to her family escorted by his royal guard. Even Khafi Khan, his most virulent critic admired the respect he allotted to female prisoners of war. But as the historian, Jadunath Sarkar reminds us; simplicity was a typical Maharashtrian trait. Life in these parts of the country did not warrant too many luxuries. Simplicity was a necessity of the times; not an extraordinary example of renunciation amongst riches. It is for this reason that the Marathas have left us with no fantastic examples of architecture, art or music. They ushered a period of Indian History which is artistically arid. 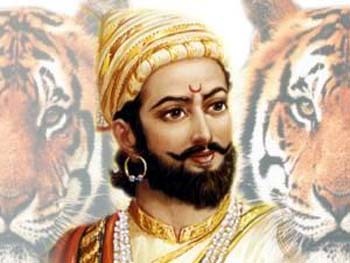 Yet, to his credit Shivaji maintained his frugal standards of living even when he was at the height of his powers and made no attempt to degenerate into the effete life of ordinary Hindustani nobles and kings at its first touch. The intelligent critic cannot help notice that all these qualities, which Shivaji represented, are abundantly found in his archrival Aurangzeb. Aurangzeb, was as Spartan, as unostentatious, as artistically apathetic [as evident from his run of the mill Moti Masjid], a hater of the arts and music in the orthodox Sunni mould. If a writer like Balakrishna (Shivaji the Great) considers Shivaji's religious devotion as proof of his disengagement from any nefarious activities then the Mughal emperor was definitely no second when it came to displaying religious fervor! III. Shivaji: Murderer or Messiah? Two controversial murders on the part of Shivaji stain the spotless attire he had been decked in by modern 20th century nationalist historians. The first relates to the capture of the strategically vital city of Javli. Jadunath Sarkar, the most impartial Indian historian of his age declares the acquisition of Javli as a result of deliberate murder and organized treachery on the part of Shivaji. [Shivaji and His Times] Unfortunately some modern nationalist historians like G S Sardesai (History & Culture of the Indian People, Volume VII, Mughal Empire), attempted to exonerate the national hero through the age-old rhetoric of necessity of the act to establish Hindu swaraj. However, Shivaji's contemporary historians made no attempts to whitewash Shivaji's conduct. Shivaji never excused himself on the pretext of establishing Hindu rajya, and the only redeeming feature in this otherwise dark episode is his absence of hypocrisy. In this context, Shivaji's character is no different from 'Akbar the great' or the mercurial Sher Shah Suri who sanctioned several political assassinations. Nothing prevented Shivaji from being as brutal and ruthless as the Muslim kings of India. He was a man on a mission to assert Hindu independence and for him the ends justified the means. Shivaji was a man of his times, where only the fittest survived and he just couldn't afford to follow idealistic deontological dictums. The second murder was that of Afzal Khan during their dramatic one to one meeting. Jadunath Sarkar conscientiously proves through the letter of the English factor record (Rajapur letter, 10 Dec. 1659 ) that Afzal planned to murder Shivaji through pretending friendship. Also, the contemporary Maratha historians who had no hesitation in charging Shivaji with murder in the case of More, all are unanimous in stating that it was Afzal who struck the first blow in the interview.This evidence rips apart the claim of Grant Duff that Shivaji had effected a pre-medicated political murder. The Englishman Burke is more considerate in couching it as a defensive murder. Some Muslim critics, question Shivaji's motives behind carrying the claw hand in the first place but this petulant suggestion is oblivious to Afzal Khan's reputation even amongst contemporary Muslims as a treacherous and deceitful man. Against such an enemy, it is improbable that the wily Shivaji would not have taken due precautionary measures. Thus, Shivaji surely betrayed his enemies but history is mute on him betraying any friends. IV. Bandit or Constructive Nation Builder? Undeniably, Shivaji followed a policy of loot and plunder. But to reduce him to a petty chieftain is making a caricature of the historical process. Justice Ranade rings home the truth that 'freebooters and adventurers never succeeded in building up empires which last for generations and permanently alter the political map of a great continent' The barbarians who ushered the eventual fall of the Roman empire did not build any new superstructure on its crumbling edifice. But the fall of the Mughal empire, scripted by Shivaji easily supplanted it with a vibrant new period of Maratha renaissance. Prof A R Kulkarni (Explorations in the Deccan History) reminds us that these obnoxious epithetsare equally applicable to any ruler or invader of medieval period of world history'when plunder or spoils of war was considered as a source of income with a budgetary head. V. Peasant Friend or Foe? Chauth was protection money, but it was not a new concept introduced by Shivaji but already prevalent in the Maharashtrian area. It was contingent to stopping the depredations of other raiders. Steward Gordon [New Cambridge History of India, the Marathas] informs us that the Portuguese offered chauth to the Ramnagar raja, but discontinued on the latter's failure it and instead offered it to Shivaji subject to his stopping the Koli raids. Balakrishna makes a startling discovery that even Aurangzeb had demanded chauth from the people of Daman in 1639. Shivaji defined it as one fourth of the total revenue of the area. Sardeshmukhi was more interesting; which Shivaji charged as head of the deshmukhs; the dominant family in the parganas. It was 10% of the government taxation. These audacious taxations were basically a challenge to the authority of the extant ruler of those parts and an indication of the extent of Maratha influence. The writer Balakrishna makes a valiant attempt to disencumber Shivaji from being the originator of Sardeshmukhi system. But even he agrees that it was transformed from a cess to 10% taxation in the later part of his regime. Sarkar is right when he says that while such a plea might have been true at the beginning of his career and in relation to Mughal territory but it cannot explain his raids into Bijapur and Golkonda, Kanara and Tanjore. Of course, it fails altogether as a defense of the foreign policy of the Peshwas. Those 19th century nationalist apologists who discovered anticipation of Wellesley's 'Subsidary alliance' in Maratha Chauth protection gloss over the fact that the latter merely involved immunity from Maratha raids and did not warrant protection from attacks by other powers. Most importantly, such a policy of repeated sacking of an economic enclave like Surat ultimately dried it up a source of supply. This denies the Maratha state any stable basis, no normal means of growth within itself. What effect would such a rapacious policy have upon peasant and tillers of the soil? Ranade is guarded in his response but admits that Shivaji's policy inevitably caused great hardships to the peasants situated in the border areas of neighboring states. (Rise of the Maratha Power) This assessment was found unacceptable to the lower caste leader, Jyotirao Phule who believed Shivaji was leading a peasant revolution. In his support, one may cite Shivaji encouraged taqqavi loans, low settlements to repopulate devastated areas and carefully commanded his army when they were in monsoon cantonments not to disturb tax collectors; uncultivable wastelands were usually excluded from assessment. While Shivaji did his best to undermine the power of the large landed families of Maharashtra, the deshmukhs, the reasons were purely out of political stability and not sympathies for the peasant. The fact is that peasants were heavily exploited long before the advent of Shivaji. The story was the same in Golconda and Bijapur as evident from Dutch records. But Shivaji's rise invariably led to the further deterioration of their already precarious condition due to continuous warfare and lack of governance in several areas. Bhimsen's memoirs betray the mode of peasant exploitation by the zamindars in Maharashtra; the latter's exploitation had no limits. They gave not a dam or diram from their own purse but pay it after extracting it from the peasants. Due to their being two zamindars at many places [One Mughal, Other Maratha]; sometimes no produce reached the cultivator's house. The peasants were absolutely ruined. Shivaji exploited the aggrieved mindset of the peasants and entrusted them into his army as the naked starving rascals. They were strictly brought up under the maxim 'no plunder, no pay!' Aurangzeb urged his officials to reduce peasants to waste for this very reason. Also, some of the Maratha officials tried to save the peasantry from illegal exactions. However, Irfan Habib, the Marxist historian debunks any view of Shivaji leading a peasant revolution. He believes the fiscal and political practices of the Marathas bearing the deepest imprint of its Zamindari origins. (The Agrarian System of Mughal India) According to a contemporary; Fryer's account, the peasants in Shivaji's domain had only that much left as to keep life and soul together. Yet, it is overindulgence on the part of Habib to register the rebellion of the peasants as solely out of economic interests. The Indian peasant was infinitesimally more religious than revolutionary, or else you would not find them to this day in Maharashtra, religiously committing suicide rather than revolt. It was principally, the religious impulse, which had enveloped the common-folk during Afzal Khan and later Shaistra's brutalization of the Hindu temples, which led to the former, developing an inveterate hatred for the latter. Abraham Eraly [Last Spring, The Lives and Times of the Great Mughals] is convinced that the Marathas were not 'rebelling against exploitations and oppression; rather they wanted to be the oppressors and exploiters themselves; and were generally worse in that rule; even against fellow Hindus; than Muslim rulers.' One wonders, whether Eraly, with his class sensitivities will now pin the blame of the agrarian crisis in Mughal India on the Marathas too? Such a sweeping generalization ends with the lamentation that Shivaji was a typical orthodox Hindu leader who did nothing new. In contrast, Balakrishna the early 20th century writer is convinced that Shivaji ushered in a true renaissance movement in medieval Indian History with strong roots in egalitarianism, equal opportunities for all and Hindu Swaraj if not raj. Today, there are Maratha brigades, which ransack prestigious academic institutions only because they aided research of an international scholar who made certain mischievous remarks on Shivaji's paternity. Sadly these followers of Shivaji behave more like Aurangzeb. Others perceive in Shivaji an anti-brahmanical leader, a messiah who wielded his sword to overthrow the power of the corrupt Brahmanas and liberate the exploited Shudras. The roots of these movements invariably lie with the Satya Shodhak Samaj founded by Jyotirao Phule in the 19th century, who was known for his virulent attack on Aryan brahmanical culture. In contrast, the early 20th century V K Rajwade, a very learned Brahmin scholar who did some pioneering work on the Marathi language was propounding the concept of Maharashtra dharma founded by the bhakti saint Ramdas. He is also said to be Shivaji's religious mentor, although recent research has shown that Shivaji came to know him only in the final years of his reign. Also, there is nothing to suggest that he meant to Shivaji anything more than a spiritual teacher; certainly not a political guide. Rajwade was attempting to paint a scenario where Shivaji was constantly surrounded by his Brahmin advisors and heeded their advice on all matters of jurisdiction. There is an undeniable attempt made by both modern Brahmins and Shudras to appropriate Shivaji as being favorable to their own position, although he himself didn't belong to either of the castes. A letter of Shivaji refers to Shivaji believing himself to be a Rajput even before the case of his coronation came up. This is consistent with the cultural milieu of his times. Undoubtedly, both had their doctrinal axes to grind. Shivaji's ideal of Hindu Swaraj rested on orthodoxy. A prerequisite for that was winning over the approval of the Brahmins. In his coronation ceremony, Shivaji spent more than a crore and half on feeding and gifting the Brahmins. This was not an exception rested in propaganda but neither a norm. He continued indulging brahmanical orthodoxy as is evident at Shri Shaila close to his death where he built a monastery, a rest house, fed a lakh of Brahmans and gave away large sums to them. The Brahmins themselves interpreted him in ambivalent modes. While some like the great poet Kaviraj Bhushan considered him to be no less than a living avatara of Shiva; born solely for protection of the Brahmana; for in his absence they would all have been circumcised there were others who brazenly interfered in his coronation ceremony on the charge of his raids having inadvertently caused loss of life and property of Brahmin families; and according to Hindu dharmashastras; killing a Brahmana was one of the five most deadly sins. There are several other instances where Brahmanical help aided Shivaji as in the case of his entry into Hyderabad which rested solely on the administrative skill and diplomatic tact of its Brahmin Ministers Ragunath and Janardhan Hanumanta Yet, close to the end of the 19th century a Brahmin would feel insulted if he was referred to as a Maratha. Shivaji did make measured checks on Brahmanical power. At one point he even considered punishing these intolerant Brahmins by removing them from lucrative secular duties like the command of armies; and instead limit them to the work they know best ' 'worshiping god'. But nowhere do we find any hint of him being endowed with a natural aversion to Brahmins, leave alone hatred for the same. If Shivaji was battling against Brahmins it was restricted to upholding the merit of the Kayastha caste. The Brahmins felt great professional jealousy against the Kayasthas for they were their only rivals in education and government service. Balaji Alvi won a brief approval through Gaga Bhat but even that failed to convince his bigoted casteist contemporaries. Shivaji's administration did envisage a society free from caste based exploitation and which granted equal opportunities where each could be self-reliant. It advocated toleration and justice towards all its members. But nepotism, corruption and inefficiency could not be weeded out in the absence of education, unification of the masses, and organized communal improvement. Shivaji's ideas of organization were not revolutionary but reformist. Shivaji made a bold and radical investment in his army organization. He was able to appreciate the importance of a navy, albeit the Maratha navy was a coastal, not a blue water navy which explains the embarrassment they repeatedly faced at the hands of the Siddi of Janjira which remained an unconquered principality. Steward Gordon also observed that Shivaji's early administration was directly inspired from his neighboring Muslim kingdoms of Golconda and Bijapur; but slowly he formulated an idea of freedom and kingship totally antithetical to Muslim states. The article is analytical , studied in depth and impartial . I too believe that King Shivaji assumes a central position in movements of self-assertion and self identity. Shivaji not only fought against despotism of Mughals and Adilshahi sultanate but also led resistance against British colonialism in western India and established ‘ Hindavi Swarajya’. Shivaji was truly a secular king as he always respected other religions like Islam and Christianity and protected their places of worships. He is one of the few rulers who practiced religious tolerance. He is revered as the epitome of self pride and nationalism across the nation. He is a pride of Maharashtra and source of inspiration for all Indians. I think this is a good analysis that helps give some hint as the philosophy of Shivaji. I have bee studing Maratha History for the last many years now. I am deeply impressed by the way you have analysised the historical evidences to prove an important point i.e. Shivaji , the great was indeed a secular king. I more research in this direction will help in unravelling the true man shrouded by biased views of policians massses and historians.